Since we were limited on time, our next task was to determine what technique was the best way to catch as many perch as we could in a short period of time, just a couple of hours. We understand that perch are, in the overall scheme of things, a smaller fish. 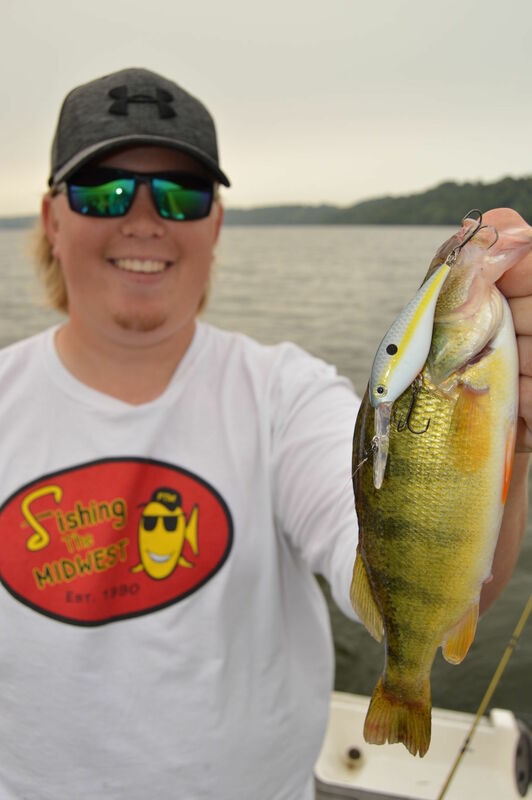 A 14-inch perch is a really nice perch, but it’s still a relatively small fish. All else being equal, we would have used a light action rod with 4-pound test line and a small jig. We wanted to catch a good number of perch in a short period of time, and they were spread out in the lake. There was a school here, another one over there, and another school a quarter of a mile away. When we found them, we caught them. We pulled Lucky Shad crankbaits behind Off Shore planer boards, and we had four lines in the water. Much of the time we had fish on all four lines. The boards allowed us to effectively get multiple lines in the water. We also netted as many of the perch as possible. Treble hooks on flopping fish can find their way into hands, and we didn’t want that. The Beckman net that we used is constructed in a way that enabled us to control the fish, but also allowed us to get the bait back in the water quickly.